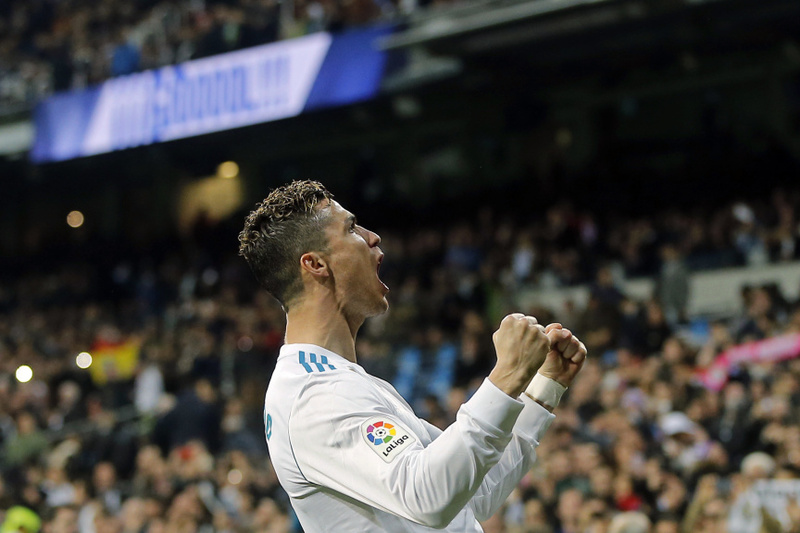 MADRID (AP) — Cristiano Ronaldo extended his impressive scoring run by scoring four goals in Real Madrid's 6-3 rout of Girona in the Spanish league on Sunday. Ronaldo scored once in the first half and three times in the second, reaching 21 goals in his last 11 matches in all competitions. The Portugal star also set up Lucas Vazquez's goal at Santiago Bernabeu Stadium. Gareth Bale scored Madrid's other goal. Ronaldo has scored at least one goal in his last eight matches. He took his league tally to 22 goals, one more than Barcelona's Luis Suarez and three behind league top scorer Lionel Messi. "It's incredible," Madrid defender Nacho Fernandez said of Ronaldo. "Again he is showing that he is the best." It was the fourth straight win in all competitions for Madrid, which regained third place from Valencia. The defending champions moved within four points of second-place Atletico Madrid, which lost 2-1 at Villarreal earlier Sunday. Madrid remains 15 points behind league leaders Barcelona, which defeated Athletic Bilbao 2-0 at Camp Nou Stadium. Ronaldo opened the scoring with a left-footed shot from inside the area after a low cross by Toni Kroos in the 11th, added a second with his left foot in the 47th, secured his hat trick from close range in the 64th and closed the scoring from near the penalty spot after another pass by Kroos in injury time. Ronaldo also made the pass for Vazquez's 59th-minute strike. Bale's goal came in the 86th after an assist by Luka Modric. Christian Stuani scored twice for Girona — a first-half equalizer and then a 67th-minute header to make it 4-2 to Madrid. Defender Juanpe Ramirez scored the team's third goal in the 88th. "It was an entertaining match for the fans, with a lot of goals," Fernandez said. The result halted Girona's three-match winning streak. The Catalan club, impressing in its first season in the top flight, remains in seventh place and still with a chance to qualify for the Europa League next season. It trails sixth-place Sevilla by two points and fifth-place Villarreal by four points.